On any given ocean outing around Tofino, one of the most common creatures of the Pacific to come across is the Steller Sea Lion. Weighing in at an average of 600 kg with a length of 3 m it's definitely not the smallest. They can be found any where on the Pacific coast from southern California to Japan, but in their greatest numbers in northern regions. Their diet consists of small rock fishes of the reefs, salmon, pollock, and cod, but have been know to occasionally eat octopus and squid. 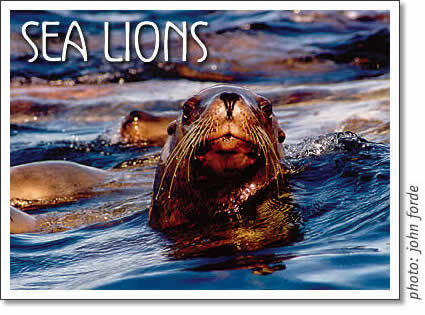 On average, an adult Steller sea lion eats about six percent of it's body weight each day. Found quite often sunning themselves on rock shelves around Tofino, the Steller sea lion is a willdlife treat to observe. They are very defensive over their territories and will greet any advance with a low roaring sound and an intimidating stern look as they rear up onto their fins. If you are lucky enough to have a gang of them greet you in the surf of Tofino, don't worry – most of their attitude is for show and have not been known to attack. The more comfortable of positions for viewing is definitely from on board a boat. On any given ocean outing around Tofino, one of the most common wildlife creatures of the Pacific to come across is the Steller Sea Lion.